This is the motto of the New York Late-Starters String Orchestra (NYLSO), and it is a welcoming mantra for those who have thought they might like to discover or re-discover their inner artist, no matter what the medium. For Ari Goldman the Late-Starters group provided the gateway for his return to the cello, the instrument he had put aside 25 years ago. 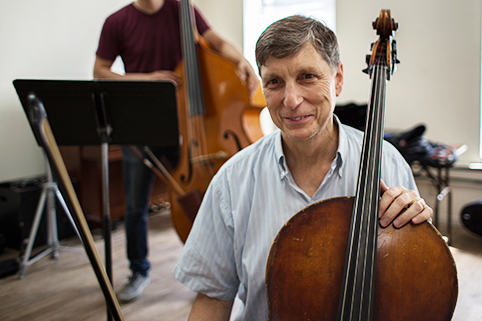 Goldman, a former New York Times reporter, tells his comeback story of how he has been able to recapture his passion for the cello in his book, The Late Starters Orchestra. His heart-warming, very personal journey can serve as an inspirational pep talk if you have wondered whether you should try an art form again or start for the first time. Choose your artistic passion . . . musical instrument, painting, sculpture, singing? It’s all possible when you put away the excuses and just get started. But do you need to devote 10,000 hours to become proficient in your art? Who has the time or dedication for that? Perhaps it was his boldness, developed over years in his position as a reporter, that led Goldman to jump into cello lessons by first securing a seat in his then 11-year-old son’s youth orchestra, sitting in on his private Suzuki lessons, and then joining the Late Starters Orchestra. He set a personal goal of performing in front of family and friends at his 60th birthday, just two years away. How he did it and what he learned can be applied to many an art form. What’s your passion? These late starters might ignite a fire under you to discover the inner artist you’ve always had within you. Never pack away your instrument. Leave it out so you can get your hands on it when t he spirit moves you. Play every day. It’s impossible to keep up with kids. Instead, find like-minded adults who are just a tad better than you are to play with. Consider every note a song. Never perform. Only “rehearse,” sometimes in public. Remember that practice makes the impossible possible. Learn a favorite song and play it to death. That way if someone hands you an instrument, you can play at least a few bars of something. Surround yourself with the music you aspire to play. 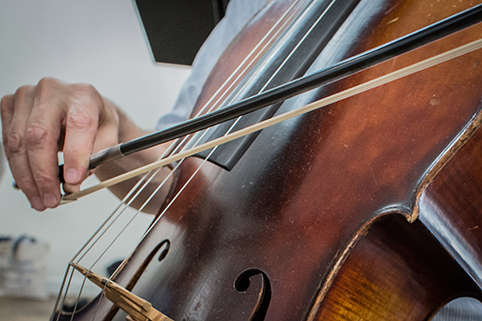 Don’t spend a lot of money on your instrument. Spend it on a teacher with an abundance of patience and a sense of humor. Don’t listen to it, even once, for at least a year. Revel in how far you’ve come when you finally do listen to it. Remember that they played this too. You are connected. You will never be a soloist at Carnegie Hall. Accept that and play because you love it! I owned my own retail operation for 24 years. During the time I owned it, I did all of my own graphics and point-of-purchase displays. When I sold my business I started to paint still lifes. I painted everything in my home. Liz Osbourne, who is 78 now, was my neighbor and still is my mentor. Probably one of the best known artists in Philadelphia, she taught for 50 years at the Pennsylvania Academy of Fine Arts. Upon seeing my artwork she immediately enrolled me in their four-year certificate program. As they say, the rest is history. Needless to say it changed my life. I paint to music and really love the challenge that each new project brings me. I paint with passion. I have a goal for the viewer to feel the life in each piece. If that happens, then I have truly succeeded. 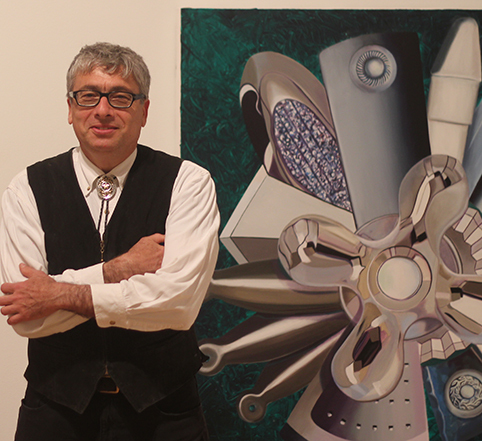 David Katz, a fine artist painting landscapes, portraits, still life, and pop art, is based in West Chester, PA. In 2003, not long after discovering handmade art glass beads, I entered the world of lampworking and never looked back. I have been married to my best friend/husband for 31 years, and when our daughter decided to leave the nest, she unknowingly donated her room for my studio. I was completely hooked with the first light of the torch. I love everything about it. The creative outlet, the artistic fulfill-ment, the chemistry. Everything! I feel that lampworking is one of the many blessings in my life, as are the many friendships I have made along the way. Recently, I started teaching lampworking, sandblasting, electro-forming, and lapidary cold work classes. It is an honor that my glass beads and jewelry have juried into the Indiana Artisan program and now carry the Indiana Artisan logo. 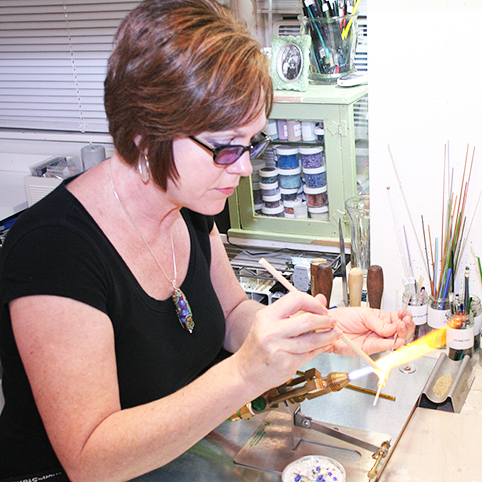 Lisa Atchison is co-owner of Indy Flame Art Glass Studio.